Engage the children with this series of exclusive printable worksheets that focus on line up subtraction. 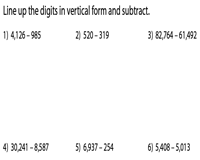 Arrange the numbers in the vertical form in accordance with their place values and employ the regrouping concept wherever required. Get ready for a delightful learning experience! 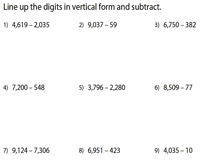 Guide little ones in rearranging these subtraction problems in the vertical format before solving them. 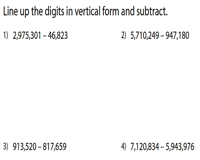 Find the difference between 2-digit and single-digit numbers. Help them apply the concept of regrouping, wherever required. This array of printable worksheets requires children to line up and subtract a mix of 3-digit and 2-digit numbers from 3-digit numbers. Boost your children's skills at regrouping with this mix of worksheets that involves finding the difference between 4-digit and 2, 3 or 4-digit numbers. This assortment of worksheets features subtraction of 3, 4 and 5-digit numbers. 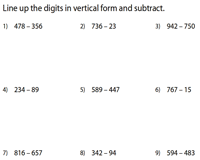 Children are required to line up the digits according to the place values. 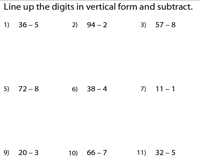 Get children to sharpen the skills at lining up and regrouping with this selection of subtraction worksheets that contains large numbers.